Have you been to a Swiss restaurant already? 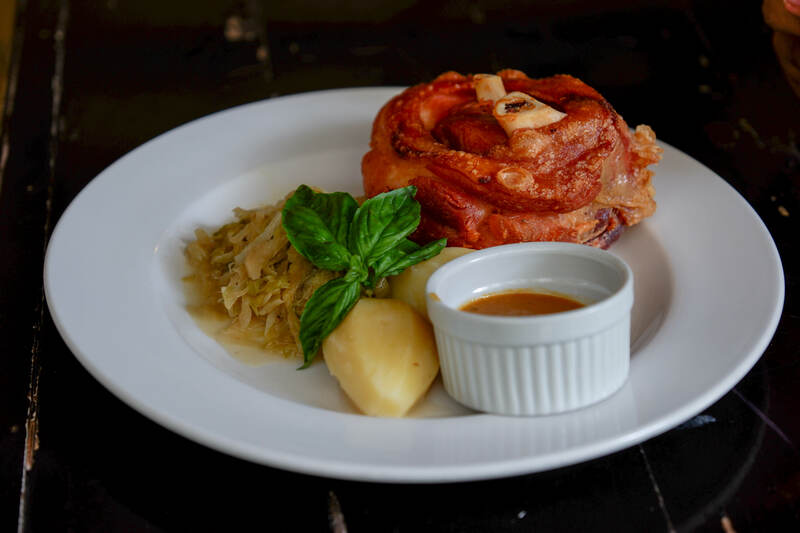 If not, it’s about time to enjoy your first time at the Old Swiss Inn in Makati. My experience here was great, and the people are really accommodating. It’s cozy and offers privacy that’s why some celebrity couples choose to dine in this restaurant. The place looks like an authentic Swiss place in the city. 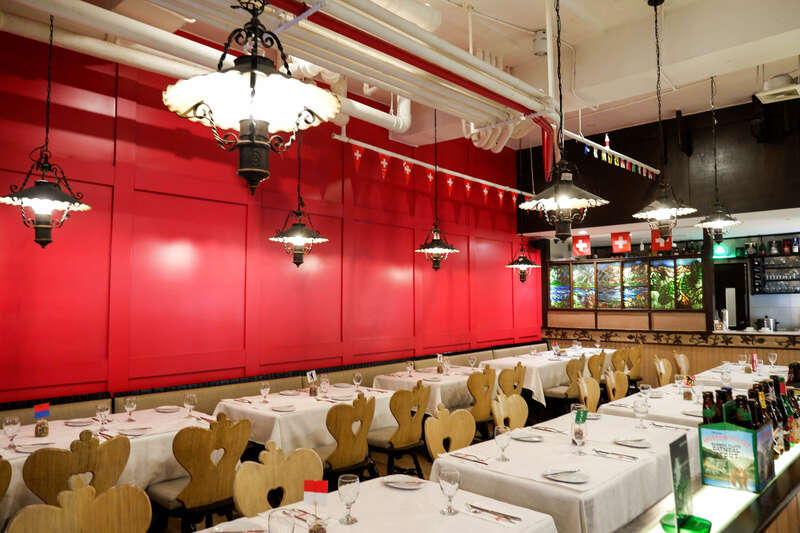 Swiss flags hang from the restaurant’s ceiling, and you’ll see fine furniture pieces that are really elegant and comfy. There’s enough space for couples, families, friends, and even a function room for group events. I’m a cheese and fondue lover so I really made time to visit the place and check out their cuisine. So here’s my food review of the menu I’ve had at the Old Swiss Inn. 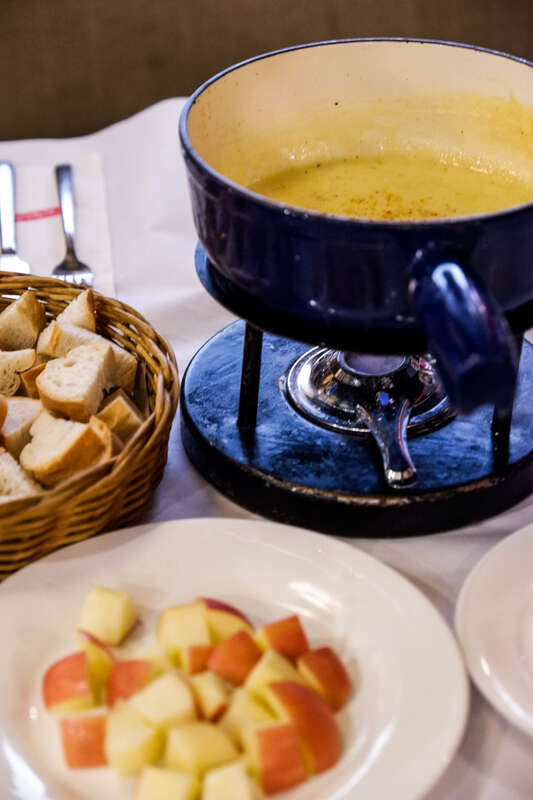 For starters, I had the Smokey Cheese Fondue which surprised me because it worked well with the bread. 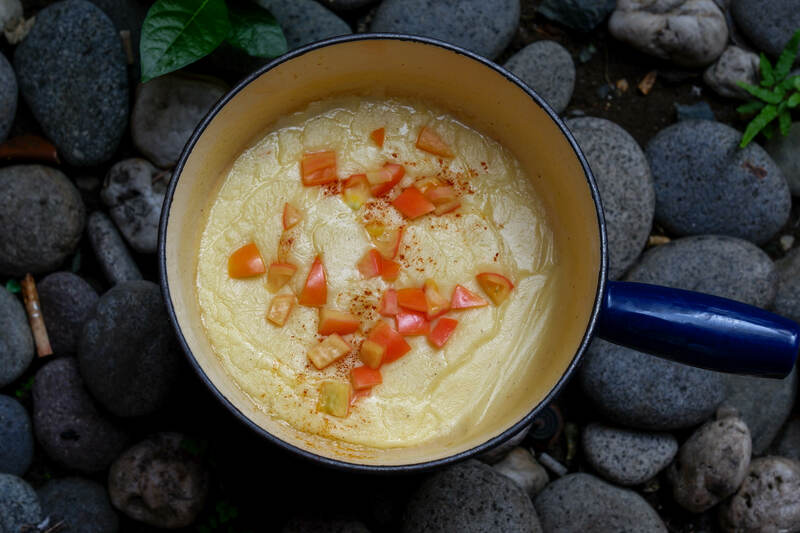 The smokey cheese had a tinge of sweetness, and you can even try it with apple for some new flavor. Then I tried the Gnagi. 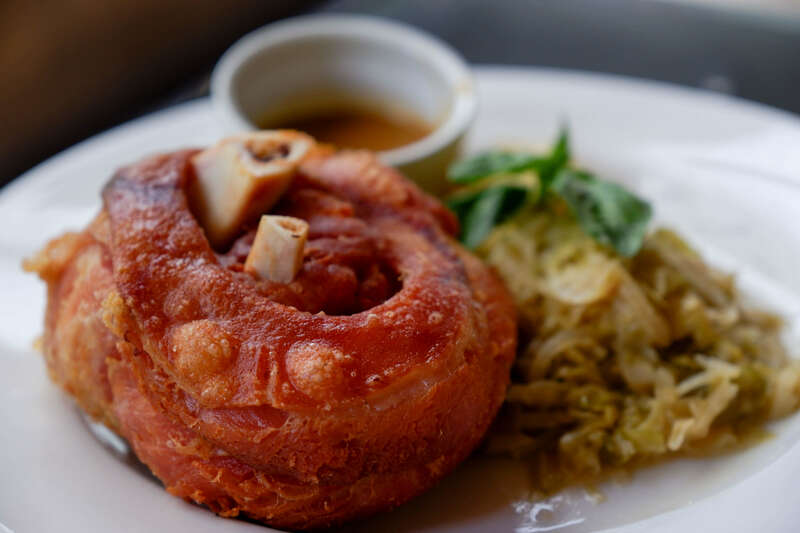 It’s a dish with cured pork knuckled, baked and served with sauerkraut and potatoes. There’s a bit of similarity to our very own crispy pata, only that they put homemade brown sauce instead of vinegar and soy sauce. Gnagi is really tender just like the one we tried in Australia. Another dish that I tried was the fresh corned beef. At home, we usually have this in our meal because my family loves it. 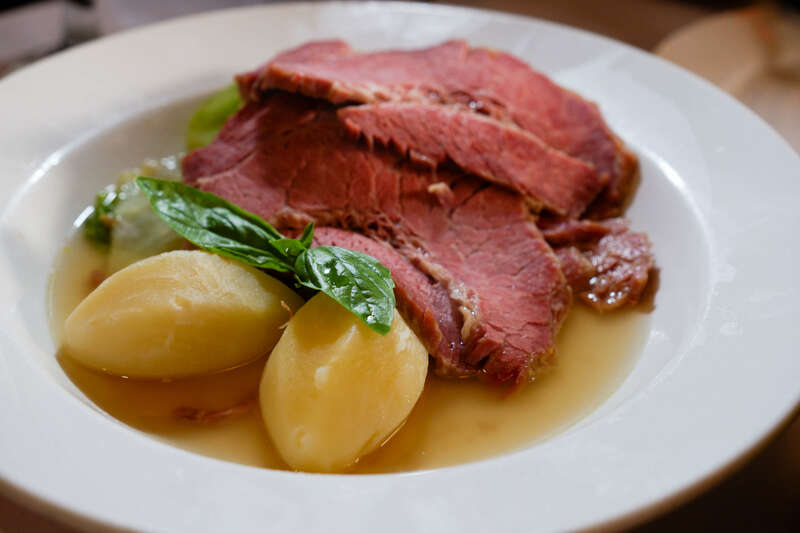 It’s not like the usual corned beef you have, such as Pure Foods, Argentina or Delimundo. Rather, it’s something that is really good in flavor and perfect with mustard and horse radish. But wait, there’s more! 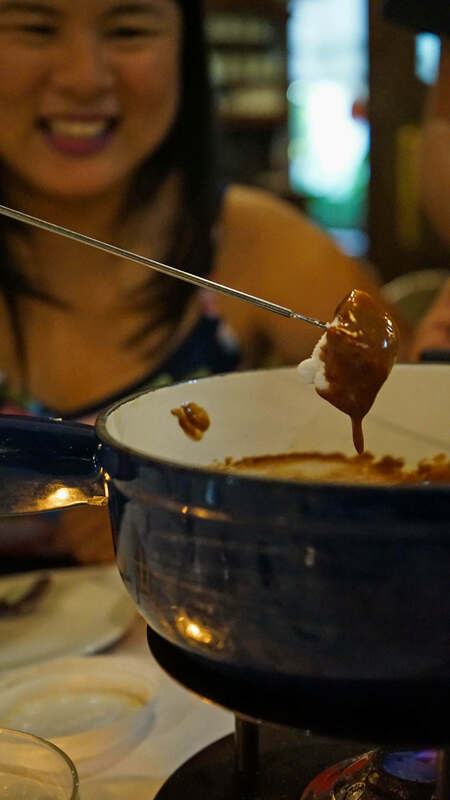 For the main event, being a fondue lover that I am, having the Dark Chocolate Toblerone Fondue is the best thing about the Old Swiss Inn. After trying it, we all just said, “it’s so good in unison”. 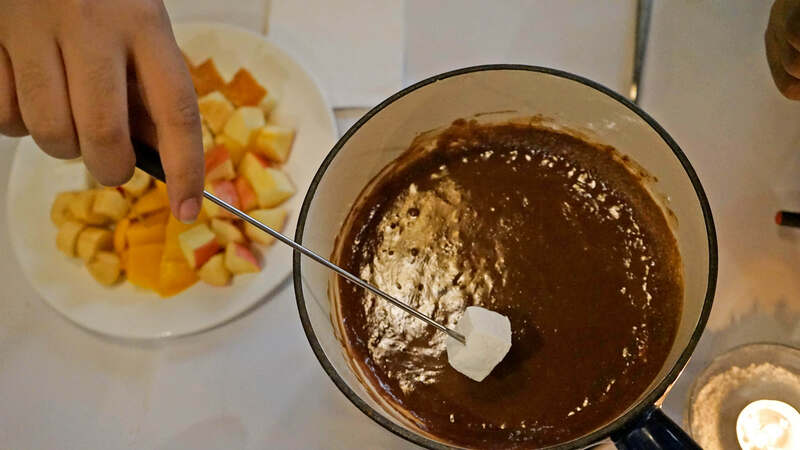 The best combination with this one is their home made marshmallows. 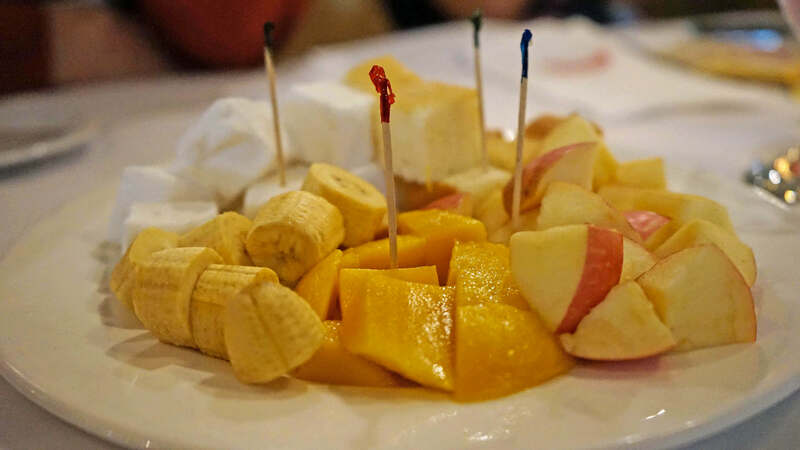 We were served with a plate full of fruits but then you can order one with just the marshmallows. I honestly would go for just the marshmallows but if you are feeling a little bit “healthier” the sides with fruits works well with it too. They use Italian cheese, and that’s what I love about the whole experience. This type of cheese is known for its natural, single origin; a dairy product from Pinky Farm, Lipa. What makes this restaurant the perfect choice is that, it’s open 24/7 so you could come visit anytime you want. If you want a late dinner date, or just came in from a late flight, you can dine here. And the ambiance is private and cozy, especially for the couples who want to enjoy a lovely dinner. Inside, you will find a classy space for executives, team diners, and romantic dates. 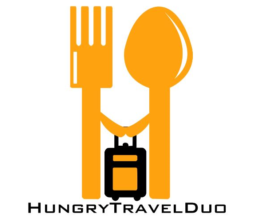 It’s located in Somerset Olympia, at the ground floor, just along Makati Ave, Urdaneta Makati. You can enjoy a hearty meal for two for only 2,000 pesos. Not only for couples and families, but the place is also open for business meetings and company events.